Active DJ & producer reference monitoring station with 5" woofer. The Wave Monitoring Station - a practical monitoring powerhouse for every DJ and producer' setup, featuring precise playback and powerful output. The innovative design makes them ideal for DJs monitoring their live mix in the booth. Producers will also appreciate the Reloop Waves series as reference monitor speakers for studio applications. 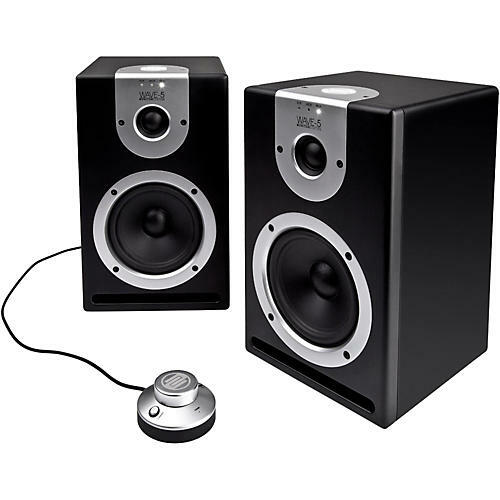 With the External Wave Controller, it' simple to control both speakers from your desktop (connected via a link cable). With the extra large aluminum knob, the volume can be adjusted effortlessly, and via the Input Selector, you can quickly toggle between the three different inputs options (each indicated by a white LED on the front). A switch can be used to set the station on stand-by, and with a push of a button, the output can be muted (LEDs dim according to the status). Thanks to the variable EQ and frequency band adjustments, the Wave series can be adapted to almost any room or situation without a sub mixer. The smart tweeter construction has an especially wide audio beam in order to deliver outstanding sound to the listener from various positions, and strong magnetic drivers create the powerful sound demanded by discerning DJs and producers. Aesthetics, versatility and performance are beautifully combined in this desktop monitoring station. Order today.